Purpose of Making: Require donations to build the school at Wat SriSaThong. Ceremony: Properly blessed by LP Sirosuwauanluck on 24 May 2011. LP Sirosuwauanluck was LP Noi’s nephew. He studied the art of making efficacious amulets and magic from LP Noi. Power: According to Rahoo subject of Wat SriSaThong, if you have one and you always pay homage to it, you will obtain a lot of properties and money will come in continuously. Also, people believe that Phra Rahoo by Wat Srisathong can protect form mischief, sorcery and evil spirits. 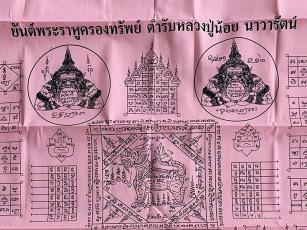 Also, Phra Rahoo can change bad thing to become good thing and induce good luck to the owner. Phra Rahoo of Wat SriSaThong – the powerful mystery in Thailand!! Luang Pho Noy of wat Srisathong, Nakhon Pathom provice was the first monk who created style of Ox amulet statues and Phra Rahoo amulets from Laos. He is a Laotian monk and popular for his knowledge in both holy Dharma and Visha (magic). 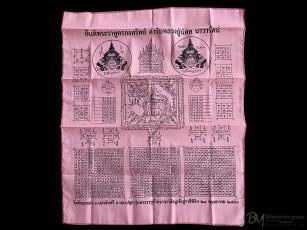 Phra Rahoo is the famous auspicious amulet of Wat Srisathong. Phra Rahoo is a mythological monster who is supposed to cause eclipses by taking the moon or the sun in his mouth. He is a kind of giant in Thai myth. The legend is that Pra-Rahoo was an immortal giant because he drank some holy nectar. The temple created Phra Rahoo amulet not only – taking the moon in his mouth – but also taking the sun in his mouth. The legend of creation of Phra Rahoo talisman was created by the two hermits. One of them was penance in the cave on Nantakhate Mountain. 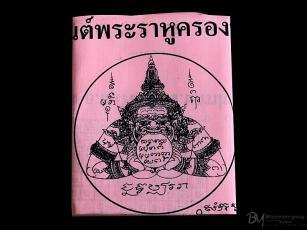 Both of them created magical drawing and magic words in order to sanctify Phra Rahoo amulet. One hermit created magical drawing and magic words of Suriyabuppa (eclipse of the sun period) to sanctify Phra Rahoo which taking the sun in his mouth. The other hermit created magical drawing and magic words of Chandrabuppa (eclipse of the moon in his mouth. The two hermits made those things because they had foresight to know that humans will face with danger and grieves in the future. The auspicious amulet, Phra Rahoo, could help people free from ones. 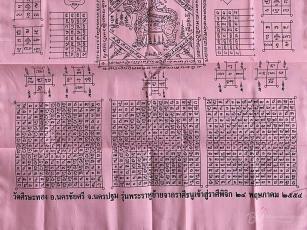 To sanctify Phra Rahoo amulet, it must be made 8 periods for being holy and effective. LP Noi of wat SriSaThong, Nakhon Pathom province was born on 14 February 1892 and passed away on 10 Desember 1945 at the age of 53 year old. He studied magic from his father when he was young. He was ordained as a monk at the age of 21 at Wat GlarngKooWieng. He has been an expert of concentration of mindfulness in Buddhism way. LP Noy is a Laos’s monk. He is has been studied the art of making efficacious Phra Rahoo statues from Laos. He was the first monk who created style of Phra Rahoo in Thailand and popular for his knowledge in both Holy Dharma and Visha (magic). Wat SriSaThong located at Nakorn Pathom Province, Thailand. It occurs from cooperation from many villagers. When it was under construction, they found Phra Thong in underground. Thus, people called “Wat HuaThong” In the reign of LP Noi, this temple was very progress. Next, it was changed the name to be “Wat SriSaThong”. Nowadays, most of people worship Phra Rahoo at this temple.